Whether you’re interested in understanding the advantages of market research, how companies use market research or just want to gain a better appreciation for the importance of market research in general, you’ve come to the right place. Here, we explain the importance of research to achieving marketing results, describe the marketing research process, dive into the importance of market research in marketing products and services and cover the consumer research process as we conduct it at OBI Creative. When done well, consumer research reveals actionable insights about customers and employees that your business can leverage to create meaningful connections with your ideal audiences. That is why we do customer research at OBI Creative. For our clients, the real fun comes in translating the data that comes from our qualitative research and quantitative research into an actionable marketing strategy. While it’s true that data is often arranged to prove any number of points, that’s not the point of research. If anything, marketing research shows that there is strength in numbers, when those numbers are used to support strategic insight. If we’re being honest, it was also an opportunity for us to refine our content planning, creation and publication activities around the PESO model and in concert with an inbound marketing philosophy. As a Hubspot-certified agency, we execute inbound marketing campaigns for business clients regularly. Still, we didn’t want to be the proverbial cobbler’s kids, so we used the campaign as an opportunity to do for ourselves what we do for clients every day. 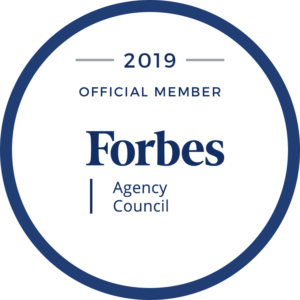 We believe in the power of the PESO model of integrated communications to drive results for our firm, so we weren’t surprised when our campaign generated 20 new leads, increased our social growth year-over-year by 32 percent and increased traffic to our website by 155 percent. We were hoping for at least one qualified business lead and generated far more than that. Our communications team began by performing a little market research on ourselves. We reviewed our agency’s business goals, set a strategy statement for what we wanted to do and outlined our communication goals. Our strategy was quite simple — execute an integrated communications plan using the PESO model to drive leads, nurture them through the sales funnel and convert them into clients. If you follow our blog again this year, you’ll see that we plan to do all of the above with our campaign content. In fact, this post is itself a pillar page on market research! While we hope this transparency instills trust, we also hope it inspires you to do the same for your business. With that lengthy introduction out of the way, we’re ready to jump into our complete guide to market research. Our Voice of the Customer (o.VOC™️) and Voice of the Employee (o.VOE™️) surveys work because from the beginning, they study the experience that a brand’s customers and employees have with that brand from their perspective. We use the following market research tactics, which are also some of the best market research tools, to define the customer research process to reveal the extent to which a brand understands its customers and employees and has its operations aligned to satisfy those desires. After this data collection exercise, we crunch the numbers and parse interview transcripts to uncover the good and bad about how a brand interacts with its customers and prospects. We mine this competitive intelligence for strengths, weaknesses, opportunities and threats. We ask what a business is doing right and where it could be doing better. One of the benefits of market research to a business is its ability to inform effective marketing strategy. Sadly, many companies invest in market research but don’t use it. We don’t let our clients make that mistake. After all, how can market research help a business if it lies on a shelf somewhere collecting dust? After the data has been presented, we craft marketing and communication strategies from the insights revealed during research. That is what companies that use market research do. Marketers have more data available at their fingertips than ever before. Yet, marketing efforts and, in particular, advertising campaigns still seem to mystify many. For example, 70.8% of small business owners do their marketing in house, yet they’re much less satisfied with their results than those who outsource marketing efforts. From small business owners to CMOs, success in traditional, digital and social media advertising feels either like an elusive combination of magic and data or a frustrating dance with sales and leadership. With marketing budgets tied to bottom-line results, it is as pressing as it ever has been to show the ROI of every marketing effort, and that can be difficult when you don’t know how to deliver results. Creating marketing campaigns with measurable objectives that deliver bottom-line results. Putting campaign tactics where they belong — after research and strategy. Many CMOs, small business owners and even advertising agencies do this when they jump straight into marketing deliverables without doing their research first. If this sounds strange, think about the last time you created a sales brochure for an agent or for your company. Did you verify that the brochure was a good fit for at least one of your customer personas? Did the messaging and graphics conform to the strategy you set for that persona? Do you ever discuss the role of marketing research in developing strategy and campaigns? Chances are good that you or someone you know has, for the sake of time or political pressure, rushed to put out a sales brochure, marketing flyer, landing page or even an entire marketing campaign without first doing your research. When the critical step of market research is skipped, it’s like building a house on sand; you have no idea when the tide will rush in and wash your house away. The same is true with skipping consumer research; you have no way of knowing whether the time and money you are investing into that marketing initiative is going to deliver the results you want. Market research is the heart and soul of OBI Creative because we know that marketing campaigns based on research consistently outperform campaigns based on hope. Research-based marketing defines the successful career of our CEO, Mary Ann O’Brien. She’s taught us to always ask whether you think your marketing strategy is based on hope or reality. Understanding the importance of market research, here are four principles you can use to put research at the heart of all you do and build a strong brand for your business. It turns out that pyramids are good for more than ancient wonders and iconic game shows. 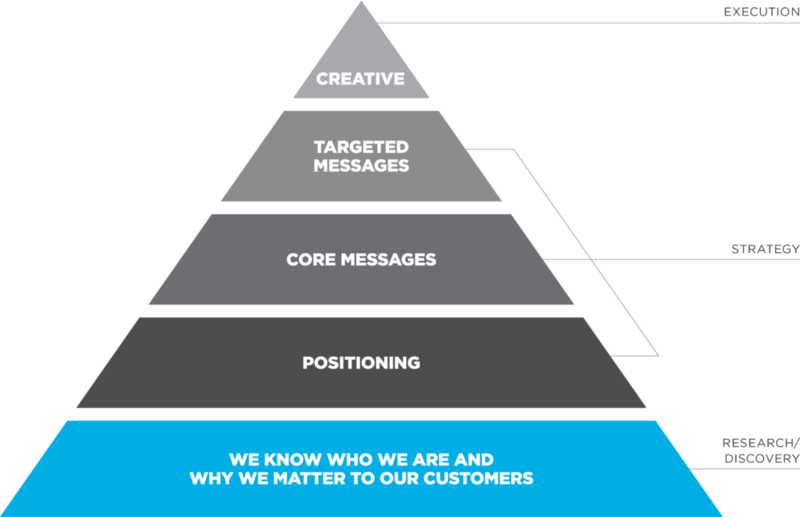 We use a pyramid to illustrate the marketing philosophy we follow to deliver brand awareness, social engagement, sales leads and other specific results our clients need. Weak brands are built from the top down. Use the marketing pyramid at your organization to build a strong foundation for your brand from the bottom up. If you want to squeeze more ROI from your next marketing campaign, study the experience your customers have with your company, from their perspective. Conduct a customer 360 exercise. Examine voice of customer examples. Gather competitive intelligence. Use brand and competitor analysis to reveal the good and bad in how your customers are interacting with your brand. Once you’ve studied your customers and, specifically, how they interact with your brand, it’s important to compare that to what you think about your customers and how they interact with your brand. “More than once, we’ve seen clients surprised to discover that what they think their customers appreciate about their products or services isn’t what their customers actually value most,” says Lana LeGrand, Director of Leadership and Operations for OBI Creative. It’s easy to get caught in an echo chamber when it comes to your marketing efforts and not see it. There are only so many hours in a day and the right marketing tools can help you make the most of them. When complemented with robust research, these are just a few of the tools that you can use on an ongoing basis to align every marketing effort with a strategy that delights your customers and delivers stunning marketing results. These certainly aren’t all the tools for business marketing research out there and finding the best ones for your business can take time. OBI Creative founder and CEO, Mary Ann O’Brien says marketers have to know their customers’ lives and their own operations to identify what customers really want and need and to what extent their operations (including sales and marketing) are aligned to delight their customers. Focusing on customer delight has led O’Brien to appreciate the importance of market research and to see the need for a shift in the marketing landscape away from brand loyalty as a strategy for sales growth and to attraction marketing, which O’Brien defines as the ability to attract consumers by understanding their values, preferences and needs by leveraging how your organization’s values, customer experience and products/services pull in like-minded buyers. The tool marketers need to attract more customers is already in their hands — market research. Marketing automation. Micro-moments. Native storytelling. There are plenty of buzzwords swirling around the digital universe. Two absolutely worth paying attention to are customer journey and inbound marketing. Chances are good that you’ve already heard these and may even use them. At OBI Creative, we incorporate these two concepts into every project we tackle for our clients because we understand that proper execution of them is essential to marketing success. Here, we break down the concepts and make the case for including them in your business vocabulary. Customer journey captures the idea that every interaction your customers have with your brand is part of a journey they are on that moves them from having no relationship with your business to arriving as a loyal advocate. Let’s answer that question with a quick and painless quiz. Think about the most recent marketing campaign you ran. How many of your messages were about your products or services? Did your display ads talk about product benefits or features? Do your last five blog posts talk more about your customers’ problems or your brand’s solutions? If your marketing messages talk largely about your products and services, you may be approaching marketing from a broadcast mindset. Inbound marketing is different because it appreciates that customers interact with your brand at different points in the buying process. It understands that customers are on a journey. Inbound marketing presumes that the goal of marketing is to delight your customers. The better you understand your customers — what makes them tick and what ticks them off, the more leads (and sales) your marketing efforts will generate. Just as important as understanding your customers’ pain points, is knowing what stage of the buying process they are in and then tailor your marketing messages to that stage. Knowing where your contacts and clients are in the customer journey helps you send the right messages to the right people at the right time, which results in marketing success for you AND your customers! In the awareness stage, you want to attract your audience with information that addresses their problems. Since people at this stage are just realizing they have a problem, keep your content focused around that and keep your solutions out of it. In the consideration stage, people have defined their problems and are actively researching ways to solve them. Forms, calls to action and landing pages can all be tools to help you provide your prospects with information about the benefits and features of products or services that can help meet their needs or solve their problems. Think of your brand as a helpful resource, providing the information they need to make an informed decision. In the decision stage, your audience is finally ready for your sales pitch because they now know what their problem is, what solution they want and are ready to buy. If you’ve built trust and delighted them along the way, they will naturally turn to you, their trusted resource, for their purchase. After the sale, continue to market to your new customers with information that delights them. Surveys, smart content and social monitoring are all helpful ways to nurture the relationship you enjoy and keep them coming back to you for their ongoing needs. Of course, each of the stages is better informed and executed when they are built on the foundation of strong and steady market research. Instead of telling you, we’ll show you by introducing you to one of OBI Creative’s customer personas. Dana is always thinking about what’s next. She’s an avid marketing and higher education blog reader. She relies heavily on updates from her agency partners and vendors on how she should be improving recommendations. She almost obsessively follows competitive colleges. For many students, her college is their second or third choice. Therefore, she wants to use PR tactics and digital marketing to attract target audiences with highly targeted messaging. Dana reports to the VP of Communications for the college but receives requests from various departments. Her days are filled with meetings and she needs to block out her calendar just to get work done. She needs help. As we mentioned earlier, Dana is one of our customer personas. We have several, all of which are designed to guide our content marketing efforts. We use them to shorten the buyer’s journey and identify customers that fit into our sweet spot of services and capabilities. Dana isn’t a real person (which you probably figured out by now). She is a representation of one of our target audiences that we created based on research and interviews. We use our customer personas to speak most effectively to our ideal clients. That includes understanding their pain points and keeping them top of mind when we write blog posts, emails, white papers, presentations and other types of content. We use them to understand why our customers search for new solutions and how to provide timely, relevant information to help them through that process. That is how customer personas fit into the market research process — they are part of the foundation that informs all of your marketing efforts to ensure that you are sending the right messages to the right people at the right time. What is the typical job title of this person? What is a day in his or her life like? Where does he/she go for information? What are his/her most common objections? What type of ROI does this customer need to justify a purchase? You can easily gain answers to some of these questions from your sales team. Other answers can come from doing qualitative research on your customers or, if you don’t have that, quantitative and qualitative research on the industry your customers occupy. If you’re at a loss as to where to begin your research, start on social media. Channels like LinkedIn and Facebook can provide a window into your ideal customers’ professional and personal interests. Use groups and profiles to determine which publications and other sources professionals turn to stay up to date on industry happenings. The point is to make sure you know to whom you are marketing. Armed with accurate knowledge of your audience, you will find your marketing efforts are more successful because you will be one giant step closer to sending the right messages to the right people at the right time. As marketers, we should have confidence in our marketing strategies because we know they are grounded in research. We shouldn’t hope our creative will connect with customers; we should know it will because the strategies and resultant tactics we craft for our clients tie directly back to who they are, who their customers are, and what they want. You can have that same confidence when you make market research the foundation of your marketing efforts. Old Rules, New Rules: Download Our Free Marketing Ebooks to Drive Results for Your Business. If you follow the guidance and implement the ideas in these ebooks, we’re confident that you’ll achieve results for your business and that you’ll position your brand to make more meaningful and profitable connections with your customers online. Download today! This is one of the best article about ROI I stumbled upon, very well-written and discussed topics very comprehensive. Thank you for sharing your wisdom!